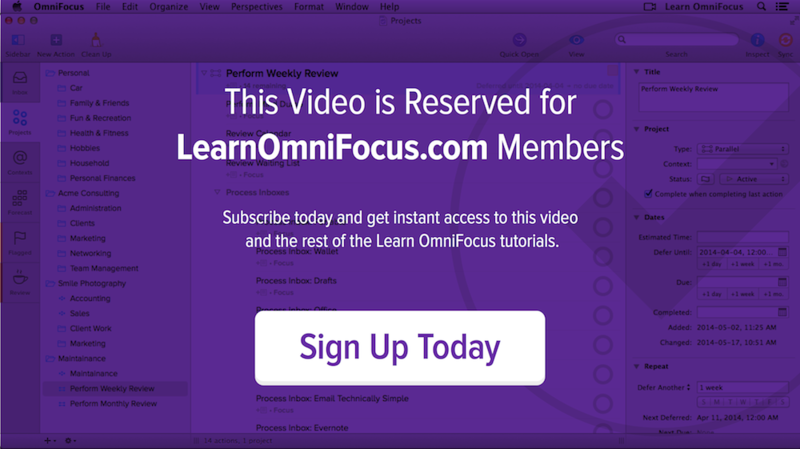 The OmniFocus 2 Pro for Mac allows you to create custom views of your data that you can access at the click of a mouse. The Standard edition of OmniFocus comes preinstalled with a number of different perspectives that provide you with different ways to view your OmniFocus database. For example, the Projects perspective allows you to view your database by project, the Contexts perspective allows you to view your database by Context and the Review perspective shows a list of projects that are up for review. If you have the Pro version of OmniFocus you can create your own perspectives. For example, it might be useful to have a perspective that shows you all your available personal tasks and another to show a list of your errands. Before watching this video it's recommended that you read the Foundation: Mind Mapping Your Responsibilities article. How to create a perspective that shows all available actions. How to create a perspective that shows all important (due or flagged) actions. How to create a perspective that shows you available actions in a specific area of your life (e.g. personal). How to create a perspective for easy access to your errands. How to create a perspective for easy access to your waiting list. How to use the reorder, modify and delete perspectives. How to add perspectives to the sidebar and toolbar. How to assign a keyboard shortcut to a perspective.